Sharon Bush has weaved her fascination of the ancient world with her love of writing and all things spiritual. Sharon has been designing and hand crafting jewellery (especially symbols and talismans made of porcelain with her Ancient Realms label) for over 30 years. Sharon is a graduate of the University of New England with a B.A. double major in History/Ancient History which spans from Mesopotamia, to Egyptian, Roman and Grecian times to that of emerging Europe and up to the colonisation of America and Australia. Among these and many other cultures are fascinating ceremonial celebrations that can be reclaimed for contemporary living. 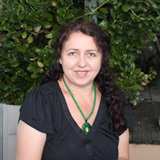 Sharon has been on her own spiritual quest delving into the mysteries of people, places and beliefs. Writing with passion and purpose Sharon combines her knowledge in her philosophical self-help writings, affirmations and blogs – these are practical, yet deeply spiritual expressions offering clarity, guidance and inspiration. Sharon believes that the sacred markings or symbols left to us by our ancestors carry a deep energetic feeling of empowerment, protection and knowledge. Sharon was born in Victoria; living in her home town close to the sea, rainforests and bushland of the majestic Australian landscape. The Mother’s Indian Fragrances: Hand rolled Incense, made according to the age-old masala method without dipping, and our Floral Perfume Oils have been widely recognized as among the very finest quality fragrance product available anywhere. 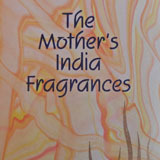 The Mother’s Fragrance creates employment opportunities for women in the local area. Hand crafted in India since 1975. 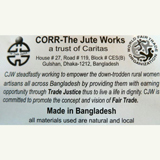 CORR Jute Works work to empower the down-trodden rural women artisans all across Bangladesh by providing them with earning opportunities through Trade Justice thus to live a life of dignity. CJW is a Christian organisation committed to promote the concept and vision of Fair Trade. Bagdha Enterprises has years of experience producing hemp products. Many of these women artisans are able to work in teams out of their homes to handspin the hemp twine. This natural fibre is then made into a unique variety of products which are outstanding in craftsmanship and design. Made in Bangladesh. Perception and Ecota provide Fair Trade goods handmade by the artisans of Bangladesh. Traditional skills have been used to create a beautiful unique items for you to enjoy! 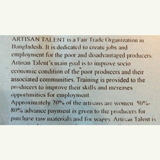 This Fair Trade product is from Artisan Talent in Bangladesh who creates employment for poor and disadvantaged women. Artisan Talent’s main goal is to improve socio economic conditions of the poor producers and their associated communities. Training is provided to the producers to improve their skills and increase opportunities for employment. All Fair Trade values are respected and upheld.